The Op-Ed piece concludes with the same argument I learned in high school economics; we should “grow lettuce, oranges, wheat, peppers, bananas, whatever, in the places where they grow best and with the most efficient technologies — and then pay the relatively tiny energy cost to get them to market, as we do with every other commodity in the economy.” This is his rationale for being wary of the terms “food-miles” and “sustainability” – which are rapidly joining “organic”, “natural”, and “free-range” as words that connote gold and denote tin. He gives very convincing evidence that the energy used in transporting grapes from Chile can be less than the energy used for the extra freezer your family buys to freeze your local rhubarb. But his fallacy is assuming that we need, as a nation of Americans, to be eating those grapes in March. When I managed the Westside Farmers’ Market, I overhead many customers ask the farmers whether they had lettuce to sell in August. Tomatoes are ripe in Michigan Augusts – lettuce is long gone. Bananas on our breakfast cereal, apple pie in May, watermelon for the 4th of July picnic, orange juice and coffee in the mornings, chocolate for Valentines Day, lettuce with tomatoes for BLTs in March ~ many food pairings in our American culture assume cheap oil, willing trading partners, and organized large-scale transportation. You only throw away that which you do not value. The NIH study tells us that Americans are a spoiled nation when it comes to food. There are 6.8 billion people in the world – 1.02 billion of them are hungry. One out of six people is hungry, yet we are overwhelmed with a relentless supply of bananas and lettuce and avocados and apples all seasons of the year. It is understandable that our national barometer for what to expect at the market has been skewed. It is understandable, and a huge tragedy, that we throw so much food away. 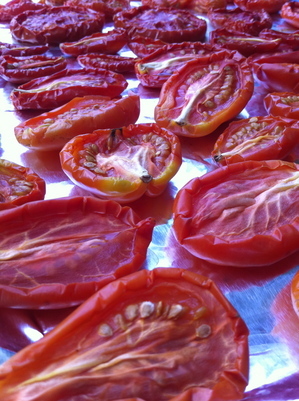 Why preserve tomatoes for the winter? I preserve my tomatoes for the winter to help me reset my internal barometer as for what I should expect on my burger. 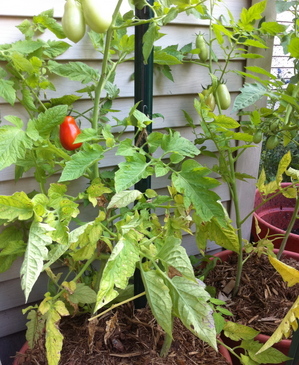 This entry was posted in In the Kitchen (recipes & more) and tagged Corinna Borden, preserving food, Real Time Farms, tomatoes. Bookmark the permalink.